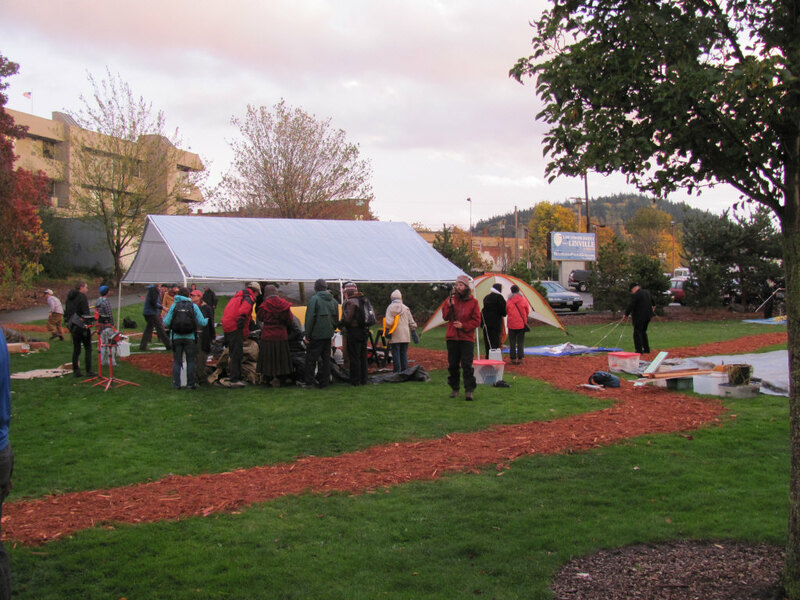 Bellingham's camp lasted longer than in some other cities, but eviction orders and police came on December 28. I think the occupation camps may have painted themselves into a corner where it looked like breaking camp would be akin to backing down. Unlike Egypt where people tried to keep occupying the square until Mubarak stepped down, changing USA culture is a longer process. The evolution of society keeps happening. Street protests in rainy weather will be hard to keep the momentum going, but come spring who knows. Also, 2012 election is coming. While things in USA may not be that bad, like conditions in repressive Middle Eastern countries, the Republican House of Representatives, elected in 2010, is particularly bad. That election pushed things to the extreme, but this too shall pass if people vote. Are Occupiers "happy campers?" like in the phrase "they were not happy campers." Bellingham's "occupy camp" is becoming like an alternative community. The city is allowing it to exist, so far. 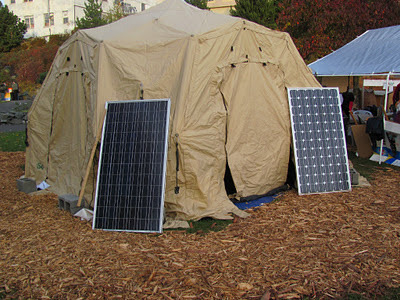 Here's a tent with solar power. Composting and recycling. In Bellingham, even some supermarkets do this. Of course there is a bike rack. I'm not in the tent city, but I toured it after the rally. 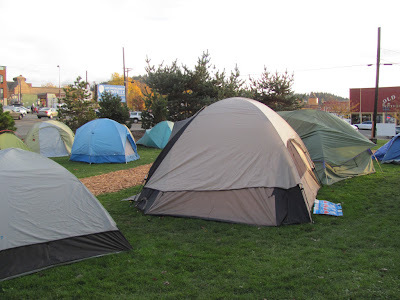 After the October 28 rally, some Occupy Bellingham folks set up camp in Maritime Heritage Park. They may not be happy campers about the state of the economy, but hopefully they are happy campers about networking and doing other things that a camp out of social change minded people will do. Seems like some smiles on people's faces, at least the first day. So far, the city has been flexible and allowed them to remain even though camping is normally not permitted in city parks. 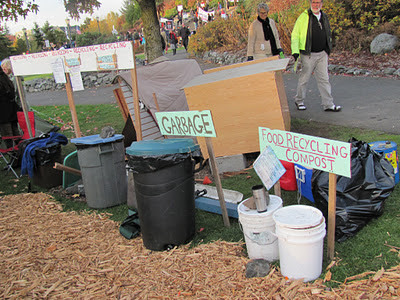 There are usually quite a few homeless people sleeping in various nooks and crannies of Maritime Heritage Park anyway. One person pointed out that having the camp out might provide some support for the already homeless around in the park. For instance someone has set up a porta potty. Regular restrooms in that park are usually closed at night, according to article in Bellingham Herald. For several years, Seattle area has had some organized camps for the homeless. * several blog posts compiled into this one. One of the "demands" being discussed in the Occupy Bellingham encampment is to make sure that Whatcom Transit Authority plans to give route 331 high priority for use of it's hybrid buses, when those buses become available to the fleet. Some folks might ask, what does that have to do with Occupy Wall Street? One of the chants I hear in the marches goes; "This is what democracy looks like." When the request, about the 331 bus route, came up at an Occupy Bellingham meeting, it got "put on stack;" so to speak, in the lingo of the occupy meetings. A small show of hands came up for "ya" and hardly any hands came up for "nay." After dropping by the meeting, I Later went home and looked up where the 331 route goes. That route is kind of like an "eclectic protest march in itself." From downtown, it meanders through the city to serve both the Barkley Village and Cordota areas. According to an article, I read, in Bellingham Herald, the WTA plans to use it's new hybrid buses on routes with a lot of "stop and go." Hybrid vehicles are more advantageous for travel through city traffic than long distance highway application. The 331 seems to meet that criteria anyway; in my book at least. So, what is the point of Occupy Wall Street? Aren't some of it's demands already resonating with common sense anyway? Aren't many of them already being met? 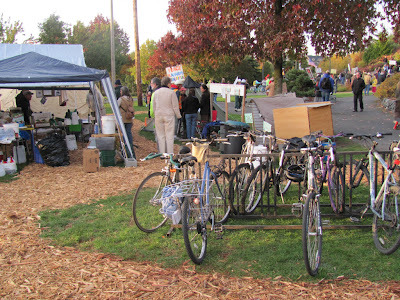 So far, the local police have allowed Occupy Bellingham's camp to remain in Maritime Heritage Park, as far as I know. I've only visited the camp twice with friends passing through. Noticed the hybrid bus suggestion on a list of proposals hanging from a wall made of plastic tarp. Looks like the local camp is fairly clean compared to some of what I've been reading about from the media, at least, in other cities. On another wall of plastic tarp was a sign that says, "Drug Free Zone." I don't know if the occupy movement, by itself, is pivotal to the social evolution that this country is going through. The occupy movement has been successful in getting people to think about problems, like the vast discrepancy of wealth in society. I see the OWS as just another part of the larger process of social evolution that takes place in society.